One area of the home that seems to be ignored more than the rest is the laundry area. Frequently cluttered and poorly laid out, this space often resembles a messy dungeon more than what can otherwise be yet another gorgeous spot in your home. 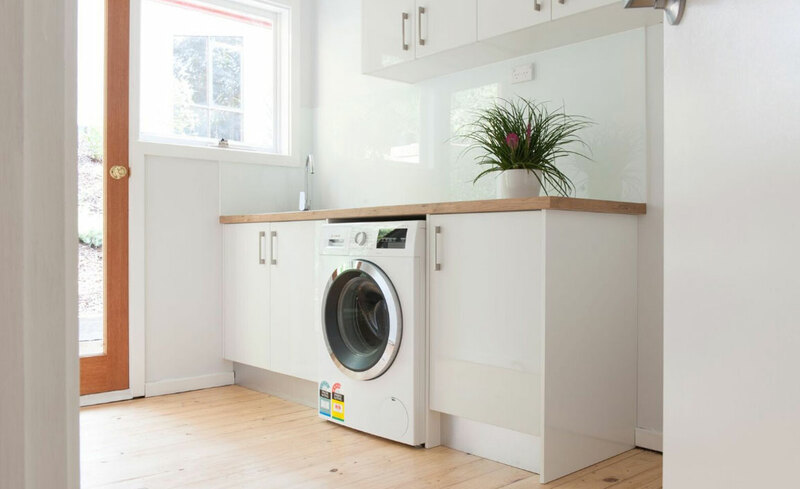 Regardless of whether you’re renovating your space or building from scratch, a flat pack laundry is an affordable way to give this room a much-needed update. Below is a quick list of our five top tips for creating a laundry space that is as functional as it is beautiful. Pick your washer and dryer before you venture too deep into the design process. While a lot of washers and dryers come in standard sizes, there are others which are deeper, taller, or wider than a typical machine. Do I want a top loading washing machine and dryer or a top loader? Am I going to choose a separate washer and dryer or an all-in-one appliance? When determining your flat pack laundry layout, you’ll need to think about what you plan on doing in that space and what items you’re going to be storing. You want to create a space that will streamline the laundering process while ensuring that there is enough room for you to move around comfortably and safely. Have the washer open from the left to right and the dryer open from right to left so you can easily transfer clothes from one appliance to the other without the doors getting in the way. The more storage you can build into this space, the better. Flat pack laundry rooms come with a number of storage features, like cupboards, drawers, and overheads. Bench space is also critical as it can be used as a dry space to organise and fold clothes and linens. The laundry sink is the perfect spot to hand wash delicates and soak soiled clothes. This is why the sink should be deeper than your typical kitchen sink and built using a sturdy material. Stainless steel is a popular choice here in Melbourne since the arguably more stylish porcelain is more expensive and prone to staining. Make sure that the sink you choose is made of quality steel, that it is thick, and that it is designed to withstand harsh chemicals and moisture. Finally, a good flat pack laundry design includes space for you to store your laundry baskets. Some of our favourite designs include concealed easy-access drawer baskets, though even having dedicated shelving for your baskets will help keep the space clean and organised. Did you know that Kitchen Shack also specialises in building practical and functional ready assembled flat pack laundries? Contact us online or call us today to book your in-store design!